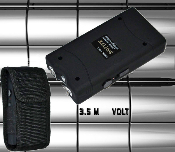 One of the smallest and most powerful stun guns that you can imagine. It is only 4" long and it delivers an awesome output of 3.5 million volts. Good enough to knock down almost anybody! This is perfect for someone who likes to carry something to protect themselves anywhere and anytime! Includes a safety release plug so it won't function if taken from you.